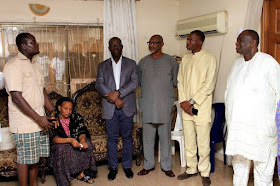 The Edo state, Governor - Elect Mr Godwin Obaseki yesterday expressed shock over the death of Prince Efosa Akenzua who was former Commissioner of Land, Survey and Housing in the state. 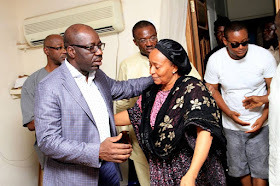 Obaseki who was on a condolence visit to the Akenzua family in Benin City, described the death as a huge lost to his political administration as he was one of those people who believed in outright governance for the good of the people. While noting that Akenzua’s footprints will remain forever in his heart, Obaseki said, “We grew up together and we attended secondary school together and for me he grew up with me as my brother. Like you will miss him i was really looking forward to him helping me in my political adventure but God knows best and i want to assure you that we will continue to be a family. “We are here for you i am here for the family, whatever arrangement is made by the family we will participate fully” he assured. While signing the condolence register, Obaseki wrote: “Rolly Murphy, you were my brother from Childhood who had god breeding, humbly a sense of purpose and a good heart. I can’t believe you won’t be there for my inauguration. I will miss you particularly now. Rest in Peace Efosa”. On his part, the state Chairman of the All Progressives Congress, APC Anslem Ojezua said, “I have had the privilege of working with him, he was more like an elder brother and we still depended on him for guidance”. Also, the Former House of Representatives member of Oredo Constituency, Hon Razaq Bello-Osaigie who prayed that God substitute the pain felt by the family and friends with happiness said “I am sorry, Please take heart”. Former Senator representing Edo South, Ehigie Uzamere who narrated how Prince Akenzua worked as a former commissioner said the good legacy he has built is one to reckon with and urged the children to live by the principles of their late father. Responding, the first son of the late diplomat, Prince Oghosa Akenzua thanked the governor elect for leading an esteemed delegation to honour his father congratulated him for his victory at the September 28 governorship election in the state. Prince Akenzua died after a brief illness.